On the eve of Emory University's 175th anniversary year, the executive committee of the Board of Trustees has adopted a formal statement of regret over the history of the school's involvement with slavery. Emory was founded in 1836 by a group of enterprising Methodists in a small town they dubbed Oxford after the famous seat of higher learning in England. The college itself was named for John Emory, a Maryland bishop who owned slaves, and a growing body of research has revealed the important role of slaves in helping to build and support the young institution. The founders and early leaders of Emory were, by and large, supporters of slavery who were influential in bringing about a North-South schism in the Methodist Episcopal Church as the Civil War neared. 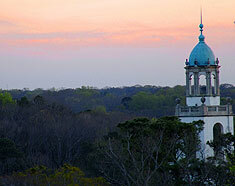 Emory acknowledges its entwinement with the institution of slavery throughout the College's early history. Emory regrets both this undeniable wrong and the University's decades of delay in acknowledging slavery's harmful legacy. As Emory University looks forward, it seeks the wisdom always to discern what is right and the courage to abide by its mission of using knowledge to serve humanity. • A five-year, Ford Foundation-funded initiative known as the Transforming Community Project (TCP). Regarded as a national model for how academic communities can productively discuss complex racial and ethnic issues, the faculty-led initiative involved more than 1,000 faculty, staff and students in small-group meetings and larger conferences over the course of its existence. The TCP is widely credited with producing a new level of understanding of Emory's complex heritage around race and slavery, dating to antebellum days. • The approach of Founders Week, kicking off a year-long commemoration and celebration of Emory's 175th anniversary, along with heightened attention to many of the University's historical milestones and accomplishments. • A planned national scholarly conference entitled "Slavery and the University: Histories and Legacies." Scheduled to be held at Emory in early February, the conference will include a Feb. 3 keynote address by President Ruth Simmons of Brown University. • Key questions about the role of slavery in the history of the institution raised by faculty, student and staff members of the President's Commission on Race and Ethnicity (PCORE). "We at Emory resolved years ago in our community's vision statement to be an 'inquiry-driven' university distinguished for our courageous leadership," says Wagner. "Honestly acknowledging some of the conditions of our early founding that we find painful today is a step that we feel required to take as we live out the values expressed in that vision. I wish to acknowledge the important leadership role played by PCORE as well as that of the leadership of TCP in bringing us to this important juncture." Johnson's father, Ben F. Johnson, Jr., was dean of Emory Law School and represented Emory in a successful 1962 lawsuit to allow private institutions to retain tax-exempt status while admitting African American students. "Emory has always been a place that seeks to act on the basis of ethical understanding," says Johnson. "The statement issued by the Executive Committee seeks to address and fulfill that aspiration." Wagner and Johnson say they expect the explorations of Emory's racial and ethnic heritage to continue as part of the ongoing life of the University, in accordance with the University's vision statement and also with an ongoing strategic initiative studying various dimensions of race and difference.